– Ride nice bikes long enough and you’ll be looking for a pronunciation guide. Ciöcc, Battaglin, Serotta, et al. And while I’m cautiously confident in the correct sounds of these brands, I’m fully certain of another, much more important one: SRAM. It’s just like it’s spelled. 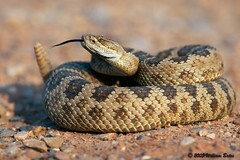 Ssssssss (say it like a snake) -Ram (like the Dodge truck). What it is most definitely not: Schramm, like Tex Schramm of NFL fame. No bike name is more phoenetical: SSSSSSSSRAM. – Gossip, anyone? From multiple sources this week I’ve heard tales of a juicy potential acquisition. Dorel, owner of Cycle Sport Group (read: Cannondale, GT, Schwinn, Mongoose), is rumored to be in talks to acquire Performance Bicycle. It’s a transaction that makes sense in almost every conceivable way. In the bike industry as it exists now, multi-channel retail is non-existent. Wanna buy a Specialized Roubaix? You need to buy it from your local Specialized dealer (whether you like them or not.) Wanna buy it from Specialized.com? Not an option. Wanna buy it elsewhere on-line? There’s only one place: Ebay, in violation of Specialized warranty. Brands like Specialized & Trek have fought bloody battles over the last decade to sire the biggest dealer networks possible, and they’re terrified of losing dealers to their rivals as a consequence of diversifying into additional sales channels. Their fear of their dealers outweighs their regard for customer convenience. If Dorel buys Performance, it provides them total vertical integration thanks to Performance’s ~94 brick and mortar locations, and their healthy online business. No company currently has integration from manufacturing all the way to multi-channel retail like this. For Performance, being acquired is pre-destined: They were acquired by a private equity concern just 3 years ago, and given the strong numbers reported by the bike industry’s most solid players, the time to sell is now. Last I heard, private equity types aren’t collectors. Buying & selling is what they do. Is there any downside to a Dorel acquisition of Performance? In terms of GT, Schwinn, and Mongoose, there’s no risk. These are big box brands (i.e. Walmart) and companies like these don’t fret about itty-bitty specialty channels like Performance. The only interesting issue is Cannondale: Word on the street is that of all the big brands, they’re the one that fared the best during the economic turndown of 2009-ish -- a byproduct of Cannondale’s excellent management of their dealer channel. Will your local Cannondale dealer stand for Cannondale bikes being parked in Performance stores? What if they’re sold on Performance’s website (or on Cannondale’s website)? 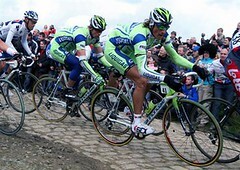 A mass exodus of previously committed Cannondale dealers is the one risk factor for Dorel here. Given the irrational, ornery ways of most IBD’s, even the remotest connection of Cannondale to Performance might cause them to jettison the brand. The drama should be fun to watch unfold. 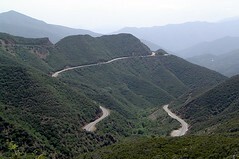 – A ride recommendation: Ojai, CA, take Highway 33 up to the top of Rose Valley. On the weekends, I was told, it’s too covered up with motorcycles and such to enjoy it. But I checked it out on a Monday and I couldn’t imagine a more scenic climb to train on. It’s 15 miles long with a steady ~5% grade (it’s steeper, maybe, at the bottom). It’s the sort of gradient where you can chit-chat your way to the top or flat-out crush yourself. The zaniest part was the descent: I’ve never gone so fast for so long without needing to touch my brakes. The road designer should get a trophy. Its long sweeping curves let you keep your straightaway speed the whole time. It was a revelation and a total blast. – A pretty spot-on ‘open letter’ at Embrocation. The only inaccurate assumption is that Campy cares about its US business. What would blow away most Americans is in what low regard the old-line Italian brands hold the US market. Campy’s OE spec in the US is literally nil (the same most definitely does not hold true in Europe), which is an easy way of gauging Campy’s mental commitment to the US marketplace. 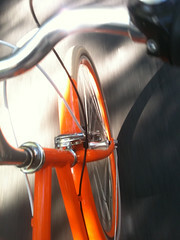 – My next bike won’t be a road or a mountain bike, but rather will be a utilitarian yet lovely Public city bike. Who, exactly, is Public? It was founded just a year or so ago by a sincerely nice man named Rob Forbes -- founder of a company called Design Within Reach. If you’re familiar with DWR, you know that it accomplished what might’ve seemed impossible: Put forth stylish and well-made furniture to middle-to-upper class America. Educate them, shape their tastes, and ultimately encourage them to buy loads of it. Based on all signs it was a formula that worked brilliantly. For a new challenge Forbes is building Public to provide the marketplace with attractive, functional, well-made bikes to use as a primary form of transportation. Public bikes have the same sort of design-minded loveliness of, say, a Barcelona Chair. Its beauty makes it irresistible for urban dwellers -- a population that tends to be fashion-conscious, but that can also most easily replace the role of a car in their lives. Where Public bikes shine brightest aren’t as design objects, but rather as bikes themselves. If you’ve ever spent a summer (or a year, or a lifetime) turning wrenches at a bike shop, you’ve built your share of flat bar-skinny tired get-around-town bikes and you know what a mess they often are. Their fenders arrive dented and ugly; the fender struts are ill-conceived, making the wheels noisy when you ride; the canti brakes feel cheap and don’t easily adjust; the saddles feel squishy and the tires cheap. In short, wouldn’t you just rather commute on your race bike? When I test rode a Public, I fell in love with one thing above all else: Its silence. The fenders didn’t ping. The shifting was crisply adjusted. The brakes never squalled. Silence tells the tale for a bike elitist, and for Public it told a very pleasing tale. They ride like bikes much more expensive than what they are. Both in its business pedigree and in its execution up to now, Public is a company to watch. And when you look at the added civic funds being devoted to urban bike paths, when you read about the traction of proposals like ‘congestion pricing’ for cars, and when you ponder the reality of the fact that urban spaces simply can’t fit more roads for the cars of their ever-growing populations, bikes like Public’s serve a curative purpose and they look fabulous doing so. – Speaking of bikes, traffic congestion, and urban spaces, this is an article you should read. – FYI, the What’s New section will be on hiatus for an unknown period of time effective immediately. It’s in part because of an impending vacation, but then I’ll have some overdue shoulder surgery (bike crashes are the gifts that keep on giving). I’ll be living a one-handed life for an undetermined period of time, so the column here will have to wait ’til I’m functional with all 10 of my tip-tappy-typing fingers again. Thanks for understanding.